Before I got sick, I took my body for granted. I could run, jump and walk and do whatever I wanted. I did not realize that this “being able to move” was a big part of my self-esteem. My illness, lupus, can attack at any moment, in any organ, in every severity for the rest of my life. To me, the most difficult part of being chronically ill is the effect it had on my own self-esteem. When you think about who you are, you probably form a kind of “mini-me” in your head. You look at yourself in a certain way. You observe your character and you see how you behave and feel in relation to others. Maybe, you even think about how much you think you’re worth. 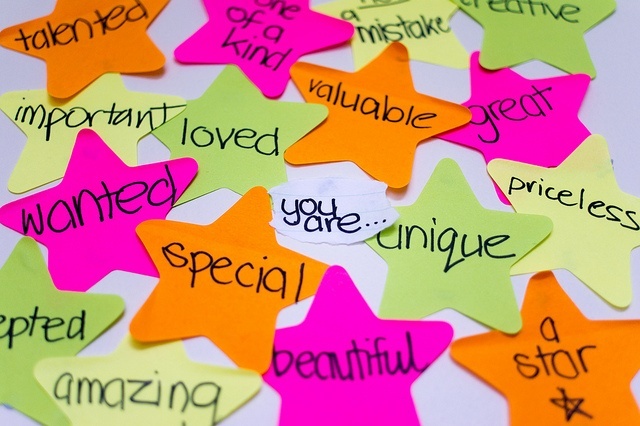 Your self-esteem relates to the image you have of yourself and how you value it. And sometimes, our self-esteem is in bad shape. Stress and difficult life events, such as serious illness, can have a negative effect on it. In moments like these we tend to see ourselves and our lives in a more negative and critical light. The voice in our own head tells us “You can’t do that.” We become shy or believe we aren’t as fun as others. We may hide ourselves away from social situations, stop trying new things, and avoid things we find challenging. This is something that we all have to deal with at some point in our lives. My chronic illness comes with physical, mental and emotional challenges. And at first glance these challenges might seem more problematic than how I value myself. Believe me, the physical symptoms can be awful and can bring me down for a while, but I always seem to revive from that. So, why is it that a chronic illness affects our self-esteem so much? Before I got sick, I took my body for granted. I could run, jump and walk and do whatever I wanted, without feeling tired or sick. It made me able to go to friends, to work on my yoga poses and to show off my drawing skills. I did not realize that this “being able to move” was a big part of my self-esteem. When my body failed me the first time, I felt horrible. Everything about how I presented myself to others had disappeared. I couldn’t visit friends, couldn’t draw anymore and doing yoga seemed impossible. In cases like this, everything that we thought defines us is shaken up, and with it our “mini-me”. For me, a lot changed within just half a year and I felt like a different person. A new, totally different me arrived and pushed the old self away. The voice in my head became really harsh on me: “I’ll never make new friends”, “I’ll never be able to be normal”, and “No-one is going to stick around with someone like me”. Now, when time passed, I learned a lot about this new me. And… She is not as bad as I thought she was. My personal experience is of course not a universal guide to self-esteem. However, it might make you think about what makes you you, and maybe even about how awesome you actually are! The first note I want to give is, it does take time. It is a slow and hard progress to accept yourself when you wish you weren’t the way you are, but it is rewarding. When you accept yourself, you regain the confidence to stand up for yourself and to be comfortable with situations that are scary. Maybe it is a cliché, but chronic illness can make you stronger than you were before. Ready? Here are my tips. Be with people who treat you well. It is unfortunate that some friends might not be able to deal with your illness. Some friendships fade when you require a bit more help. Try to let them go. The friends who stayed through everything are amazing! They love you for who you are, even when your you changed. If these people lift you up, if you can be yourself around them, they are perfect for you. These friends are exactly what you need in times when you feel a bit down about yourself. They might even make you realize that your new you is just as good as the old one (maybe even better). It’s always good to try your best, but you do not need to be perfect. No-one is perfect, everybody makes mistakes, and everyone has something to struggle with. Even with the disabilities you were given, accept your limits. One day you run a marathon, and on another day getting up feels just as big. Every achievement within your limit is an achievement. When I feel too sick to do anything, I see small things as big accomplishments. “Yes! I made my own breakfast today and you know what, that is why I am very competent.” Accepting your limits might change your perspective on your awesome new self. Focus on what goes well. Last, but not least, I try to focus on what goes well. What can I do? What can I achieve? And what is nice about my situation? Maybe the person next to you, in your hospital bed, is friendly and funny. You just made a new friend. Maybe your mom suddenly gives you a lot more hugs than she did before. Or maybe you can find some peace of mind in being sick. Considering your illness, you are pretty lucky and pretty cool to be able to see the bright side of life. These tips are just examples, you might have even found your own way to a higher self-esteem or you might still be struggling. Wherever you are in the process, it is okay. Your self-esteem can be lowered due to your illness, but with a little help from others and some time we will feel that our new self is just as good as the old one. Being sick is not easy. But despite everything, you can be a nice, caring and lovely person. Just like me, you might struggle every now and then, but that does not diminish your value. My self-esteem is something to fight for and so is yours. Wherever you are in the process, it is okay. Our self-esteem can be lowered due to our illness, but with a little help from others and a little time we will feel our new self is just as good as the old one. Being sick is not easy. But despite everything, you can be a nice, caring and lovely person. Just like me, you might struggle every now and then, but that does not diminish our value. My self-esteem is something to fight for and so is yours. Stay awesome!